For use in applications where the temperature of the process fluid must be regulated as it passes through the hose. In some applications, an additional ‘melt out’ facility may also be required. The heating element comprises either a resistance or self-regulating element spirally wrapped around the hose assembly. 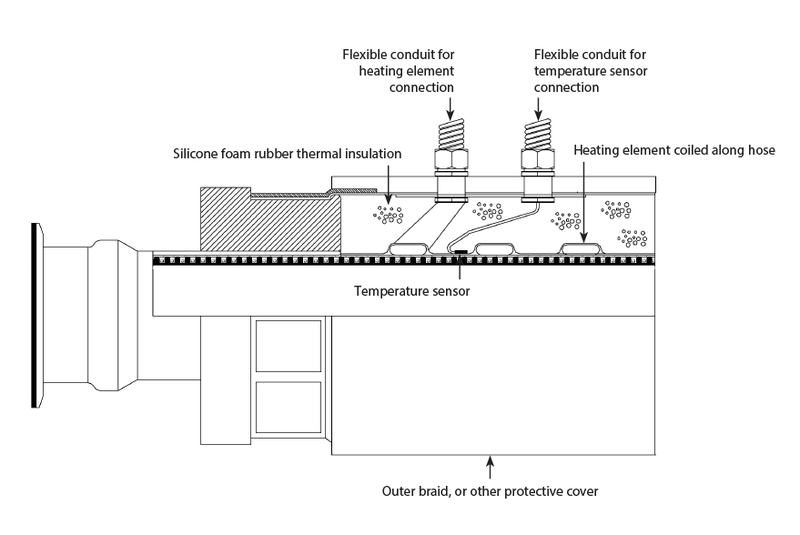 Self regulating elements may require a sensor and controller if a specific maintain temperature is required. Please consult Aflex Hose for clarification. Resistance element heated hoses usually also require a temperature sensor to be built in to the construction and must be used in conjunction with a temperature controller. The power leads and (if applicable) temperature sensor leads emerge from the hose assembly at one end, through glands and conduits. The thermal insulation is foam rubber, silicone foam rubber for temperatures above 80˚C (176˚F). The outer cover may be a polypropylene yarn or SS wire braid with a rubber cover if necessary. Each hose is custom designed and built. Application details must be supplied by filling in an “ETH Hose Questionnaire”, available from Aflex Hose. Generally, for Hazardous Areas, particularly “ZONE 1”, the Self Regulating type of heating element is employed, with or without a temperature sensor and control, and flameproof glands and conduit are also required. The watts per metre of the heating element, the pitch of the spiral on the hose, and the thickness of the thermal insulation are all calculated in accordance with established formulae to give the required maintained temperature. As for Bioflex Ultra GP, SS in Specifications, except that the Minimum Bend Radius is tripled and the outside diameter and weight are significantly increased in line with the particular design. Maximum ETH Hose Assembly Lengths are as Bioflex GP, SS. 1” PTFE lined PN10 flange spigots on heated hoses can only have a maximum flare diameter of 50mm, not 63mm. If the hose is “hanging”, straight or at 90˚, under its own weight, special construction is required, so advise Aflex Hose accordingly. Minimum ETH Hose Assembly Length, when collars are used 750mm.